Maiden is all about our first voyage, it was the first batch of beer brewed in our brewery and has been the first brew of each calendar year since then. Our goal is to create something that with each vintage evokes the same spirit of adventure, sense of the unknown and enjoyment of the journey.We take a carefully crafted American Hoppy Barley Wine and then age it in various barrels for the year, with the goal of bringing them together in a harmonious blend prior to bottling. This journey means that each individual barrel will impart different characteristics on the beer, sometimes from the quality and type of wood used, but more potent the liquid stored in it previously. The Journey So Far For Maiden 2013 a combination of Tequila, Armagnac, Bourbon, Rum & Brandy Barrels were laid to rest for 10 months. The aim is always to create the best possible blend that is more than the sum of its parts, so it doesn't matter how much beer comes out of each barrel, or if all barrels are used. For 2013 the Rum barrel imparted huge flavour but did not play nicely with anything else, so ultimately didn't make the cut. 10% of each barrel was left and topped up with fresh Maiden to begin a Solera system. New barrels available for our 2014 blend included Banyuls, White Wine and Sauternes, which helped to add a real depth to the year's vintage. We found that some of our barrels had picked up Brettanomyces, so immediately discounted them from Maiden and marked them for use in other projects. The 2015 VintageWe were particularly happy with the fresh Maiden brewed this year, and it's made up 50% of the 2015 blend. The other half consists of the following barrel-aged barley wine: 33% Auchentoshan, 21% Red Wine, 15% Jack Daniels, 9% Pedro Ximenez, 9% Madeira, 4.33% Tequila, 4.33% Glentauchers and 4.33% Banyuls. We'll be releasing the beer in our customary special 375ml bottles with wax sealing. 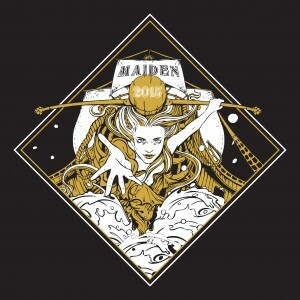 Maiden 2015 Launch There will be no Festival of Wood to launch Maiden this year, instead we've turned to one of our favourite pubs, The Hope in Carshalton, where we'll be showcasing Maiden 2015 on cask and keg and vertical bottle tastings with the two previous releases. We'll be bringing along a selection of other special beers for the occasion on cask and keg. We're also holding a very special charity raffle for a 1.5l hand-painted Magnum of Maiden 2014. This is one of only 20 that we had painted by the illustrator who designed the original artwork. All proceeds from the raffle will be donated to St Raphael's Hospice.Join us on Friday, 1st April: The Hope 48 West Street, Carshalton, Surrey SM5 2PR Keep an eye on Twitter, Facebook, Instagram and your inboxes for further details on our launch.